What order should you read the Little House books by Laura Ingalls Wilder? Many people choose to read them in the order they were published. However, Farmer Boy can be read at any time in the series because it focuses only on a year in the life of Almanzo Wilder, the boy. 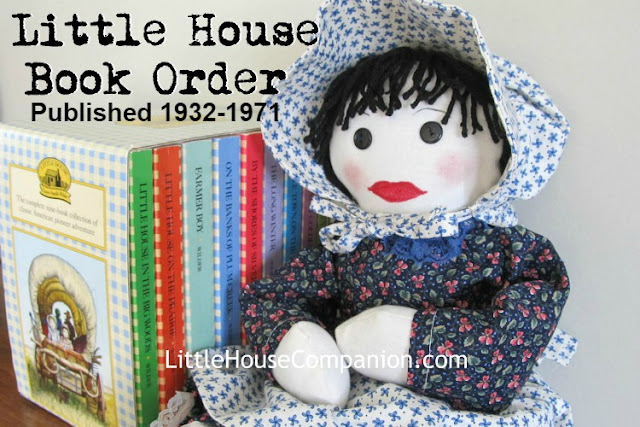 This is the list of Little House books by publishing date. * These Happy Golden Years was the final book in the Little House series. When Laura Ingalls Wilder wrote The First Four Years, from letters we know she wrote it for adults instead of the Little House series. However she never submitted it to her publisher or even revised the book. It was not published until after her and her daughter, Rose Wilder Lane's deaths. When Laura Ingalls Wilder first dreamed of publishing her story, she wrote her memoir for adults. She was not able to find a publisher for that story, so she rewrote portions and sold Little House in the Big Woods as a children's book. Laura Ingalls Wilder's autobiography was finally published by South Dakota Historical Society Press in 2014 and titled Pioneer Girl (linked to my review). The annotations by editor Pamela Hill Smith make this a bit of a encyclopedia--perfect for adult fans of the Little House books who want to understand more of the story. Annette is a nonfiction children's author. Learn more about her books and presentations at www.AnnetteWhipple.com.